Mishra Dhatu Nigam Limited, Midhani invites applications for the recruitment of 45 Junior Operative Trainee, 41 Senior Operative Trainee and 21 Junior Assistant Posts in Hyderabad, Andhra Pradesh. ii) For 5 years experience: Diploma in relevant Engineering (Mechanical/ Metallurgy/ Civil/ Electrical/ EEE) with 60% marks with min. 5 years post qualification industrial experience in the relevant area. i) For freshers: SSC+ITI with NAC. ii) For years experience: SSC or ITI with NAC or Equivalent with min. 7 years post qualification industrial experience in relevant area. Selection will be made on the basis of Written Test/ Practical/ Trade Test. Date, Time and Venue of the Written Test/ Practical/ Trade Test will be intimated to the short-listed/ eligible candidates through E-mail/ Midhani Website only. 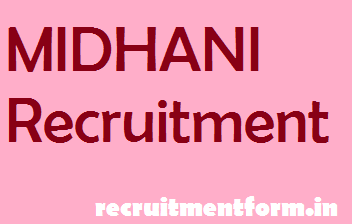 The interested and eligible candidates can visit the MIDHANI www.midhani.gov.in and then read carefully the eligibility criteria and the instructions to apply online by clicking on the link e-recruitment.